Give your Audi a personal touch of style at an affordable price with the new Audi S4 GP Thunder 5800K Halogen Bulbs. 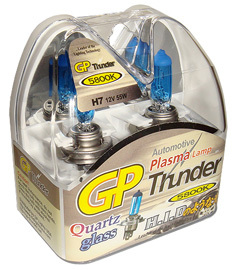 These GP Thunder Bulbs features a Super Bright White color, and is available in all sizes. Quality is never an issue with these supreme quality light bulbs; they are made of fused quartz glass and produces an incredible amount of power for such a small bulb. The excellent heat shock-resistance prevents the bulbs from breaking even when there is water over the surface while powered on. Turn heads like never before by replacing your OEM halogen bulbs with the new Audi S4 GP Thunder 5800K Super Bright White Bulbs! *Only if your S4 has halogen bulbs. Please ensure your vehicle does NOT have HID low/high beams. There are many car enthusiasts that desire the white, or blue HID (high intensity discharge) look. Many people go to great lengths to achieve this desired look, from buying a HID conversion kits to retrofitting projectors to attain the desired beam pattern. There are very many alternatives to achieving the HID look, and many choose to take the cheaper route which is the HID look bulb replacement. These HID look replacement Audi S4 GP Thunder 5800K bulbs are a great alternative to actual full HID conversions.